If you are here then you have an interest in schooling your children at home. The information out there can be overwhelming to say the least. Even a diligent parent can become easily overwhelmed and frustrated just due to the shear amount of information that exists. The greatest part about homeschooling is that you can choose what works for your family. The problem is that it is very hard to sift through what is out there. There are as many different ways to homeschool as there are families! And therein lies the rub. Hopefully, in addition to learning what is out there, this will assist you in finding a great program that you can be happy with, get some questions about general homeschooling answered and be confident when you're through! 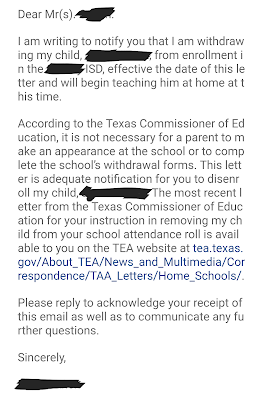 The courts have determined that Texas homeschools are private schools for the purpose of compulsory attendance. As such, homeschools are not regulated, do not require teacher certification or third-party curriculum approval, and they are exempt from compulsory attendance laws. If you are in another state than Texas, you can check your state's laws here. This is the actual email I cc'ed to the principal, couselor and the attendance clerk. What do I teach them?! What kind of homeschooler am I? To read about popular homeschooling ideologies or to pick from a list of resources click here - if you need help with scheduling and organizing the curricula you choose you can ALWAYS email me at donna.knox84@yahoo.com - I will be adding a scheduling link on here to help teach that as well, but until I do, please feel free to ask. It is much easier than you think. Pick what you want to offer and go from there. You and your child are two separate individuals. You likely have separate interests and you learn in different ways. Even if you have similarities, you most likely can pinpoint several differences in the ways that you learn. Whether that be because you are an adult and they are a child, or a difference in learning style altogether. It would benefit both of you greatly to pinpoint some similarities and differences between your personalities and learning styles to start out with, this way when you come against a difference, you can laugh it off or find another approach. Learning styles and personality traits are hard engrained in all of us. You cannot change your learning style or personality traits, but you can rub off rough edges and learn to cope with others whose learning styles and personality traits differ from our own. This is called socializing. You will find that the socializing that is done in a public school forum differs greatly from how you will view socialization in your homeschool. There is almost never another time in life in which we are made to sit in a room with 20-30 individuals our exact same age, with uniform thoughts and ideas for 8 hours. There are times in which we must be somewhere for 8 hours, but almost never with those our exact age and as adults we snub our noses at uniform thought. So why would we subject our children to this line of thinking? Homeschoolers know that socialization can be accomplished with children and adults of all ages, and is BEST accomplished with those who differ in thought, lifestyle and home-lives than our own. It has been my experience that homeschoolers do not raise their hand or form circles to sit in easily, but they are some of the most well adjusted individuals. Any shyness, in my experience, has more akin to personality traits than schooling philosophy. You may find that your previously shy and introverted child thrives in homeschool! That their shyness and unease has been eradicated by finding a tribe in which they are able to discover their self-worth and that they feel accepted in. You don't need "socialization" as society deems necessary, but many do find the need for community. It is in the connection with others that we really feel the need for, not uniformity. Connection can be accomplished through church, co-ops, groups, etc. There is likely an entire world of homeschooling in your area that you have no idea exists! They fly under the radar for the most part because they meet when children are in school and most adults are working. There are co-ops and groups geared toward just about anything you can imagine. "What about being on level?" You can do this. Your CHILD can do this. Children who struggle in public school flourish at home. When I answer questions for new homeschoolers they ask "What about their 504 accommodations?" I ask... "Well, what do they do for them?" The answer is almost always that they have someone read questions aloud to them if they have a learning disability. Or that they have someone come in and do phonics work with a child behind in reading. "So.... basically everything that you would be doing as a homeschool mom anyway, right?" The public school standard is so low in comparison to my own homeschooling and history and science are a joke in public school. I encourage you to look up the teks in Texas. It won't make sense to you how low these are until you have a few months of homeschooling under your belt. Any RTI or supplemental services that children get with in the public school system is because they aren't on an imaginary school standard. The standard does not exist. The public school system in America likes to scare parents into being on a "level". Grammar is the same for all 12 years of schooling. Reading comprehension can be accomplished in situations where the child never having read anything before. Ever. I'm not telling you to not teach anything. I am telling you to let go of what society tells you about educating your child. I still teach my children on a level for every subject. Most parents think that homeschoolers should be advanced. I'll tell you, they moment you let go of the idea of a level or a standard for learning, that's when you will really blow it out of the water. 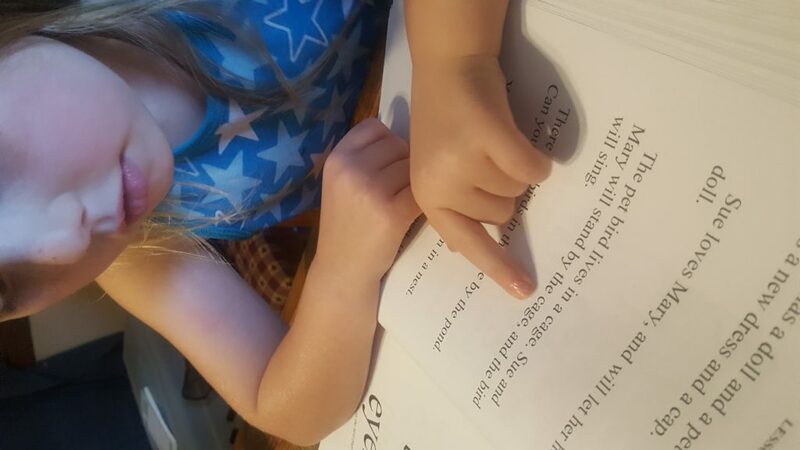 My kindergartener is going to graduate kindergarten having memorized her multiplication tables and with a solid ancient history under her belt. Let go of the level. Don't underestimate them. "What if I still want to know where they place at the end of the year?" There are no requirements in Texas Homeschool Law that require your child to take the Staar exam. However, there are 35-40 questions on the science, reading and math Staar exams. You can find the released exam here for previous years with answers. If you still feel really passionate about levels, have them do a Staar exam at home. If you don't care about exact timed administering of the test, you could do a question on each exam a week and be done by the end of the school year with all Staar exams. If you would like to test certain subjects at the end of the year, Teaching Textbooks and Saxon have a great placement tests for math. The California Achievement Test tests all subjects and the results are given in this format. The test is only $29 and valid in all states, regardless of the name of the test.